Think of ourselves though we may as living in a noisy era, none of us — not even members of stadium-filling rock bands known specifically for their high-decibel intensity — have experienced anything like the loudest sound in history. 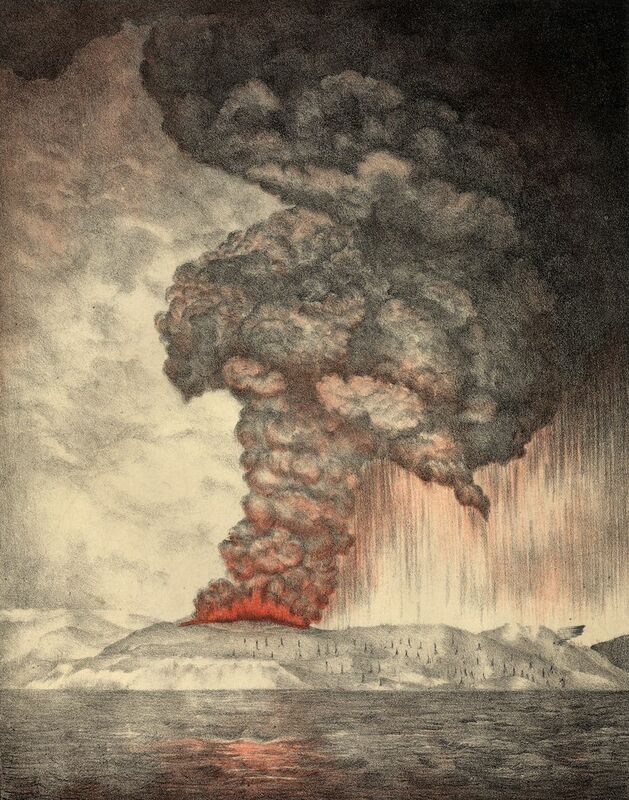 That singular sonic event came as a consequence of the explosion of Krakatoa, one of the names (along with Vesuvius) that has become a byword for volcanic disaster. And with good cause: when it blew in modern-day Indonesia on Sunday, 26 August 1883, it caused not only 36,000 deaths at the very least and untold destruction of other kinds, but let out a sound heard 3,000 miles away. "Think, for a moment, just how crazy this is," writes Nautilus' Aatish Bhatia. "If you’re in Boston and someone tells you that they heard a sound coming from New York City, you’re probably going to give them a funny look. But Boston is a mere 200 miles from New York. What we’re talking about here is like being in Boston and clearly hearing a noise coming from Dublin, Ireland. Traveling at the speed of sound (766 miles or 1,233 kilometers per hour), it takes a noise about four hours to cover that distance. This is the most distant sound that has ever been heard in recorded history." Anyone who writes about the sound of Krakatoa, which split the island itself, struggles to properly describe it, seeing as even jet mechanics lack a comparable sonic experience. Bhatia quotes the captain of the British ship Norham Castle, 40 miles from Krakatoa when it erupted, writing in his log that "so violent are the explosions that the ear-drums of over half my crew have been shattered. My last thoughts are with my dear wife. I am convinced that the Day of Judgement has come." Krakatoa's reverberations – not heard, but felt and recorded as changes in atmospheric pressure – passed across the whole of the Earth not once but four times. The sound of the explosion aside, "the rest of the world heard such stories almost instantly because a series of underwater telegraph cables had been recently laid traversing the globe," writes the Independent's Sanjida O'Connell. "This new technology meant that Krakatoa also generated the first modern scientific study of a volcanic eruption." A Dutch scientist named Rogier Verbeek turned up first to gather details for a detailed and pioneering report, followed by geologists from London's Royal Society, whose 627-page The Eruption of Krakatoa and Subsequent Phenomena you can read at the Internet Archive. Since nobody would have got the explosion on tape in 1883, such verbal descriptions will have to suffice. Not that even today's highest-grade recording technology could withstand capturing such a sound, nor could even speakers that go up to a Spinal Tap-level 11 reproduce it. And no other sound is likely to break Krakatoa's record in our lifetimes – not if we're lucky, anyway.